It was 2005 when US Embassy in Cairo last participated in the Cairo International Book Fair. This makes its return to one of the most prestigious and celebrated cultural events in Egypt for that event’s golden jubilee an occasion to celebrate. Without explaining the 14-year absence Dorothy Shea, the Deputy Chief of the US Mission in Cairo, says “the important message is that we are back. And we are happy to be here again”. According to John Ragheb, the Manager of the Cairo Arabic Book Program, thousands of books are translated under the umbrella of this programme in the fields of literature, politics, business, self-help and so on: “In collaboration with selected local publishing houses, we support the translation, obtain the copyrights, support and supervise the publishing of the books, then we buy 1,000 out of 3,000 copies of each book to be distributed locally to the libraries and academic institutions and regionally to other embassies in the Middle East”. 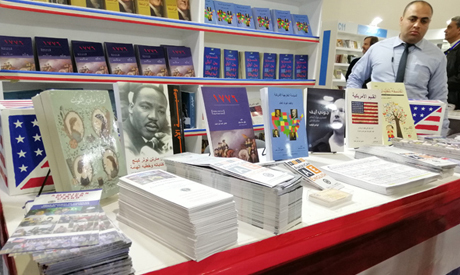 The Cairo International book fair is a unique opportunity to promote the programme to the Egyptian audience and offer the books at reasonable prices: “We have many books which are concerned with American culture, but there are also books that are more attractive to local readers such as those on business, literature, entrepreneurship, in addition to children’s books. We try to strike a balance between the interests of Egyptian readers and the need to representAmerican history and culture in one place”. Highlights of the Cairo Arabic Book Program include Why Nations Fail: The Origins of Power, Prosperity and Power by the Turkish-American MIT economist Daron Acemoglu and the Harvard political scientist James Robinson, the contemporary classic Democracy in America by Alexis Tocqueville, Jonathan Ive: The Genius Behind Apple’s Greatest Products by bestselling tech author Leander Kahney (published in Arabic by Al-Karama), Thinking, Fast and Slow by psychologist-economist Daniel Kahneman (published by Kalimat Arabia), Babbitt, the 1922 satire of industrial city life that was won Sinclair Lewis a Nobel Prize (published by Dar Al-Tanwir) and the science fiction classic Fahrenheit 451 by Ray Bradbury (published by Dar El Sherouk).